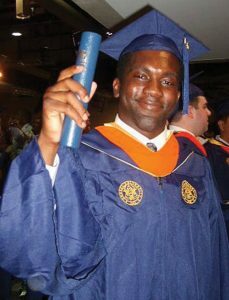 Drexel University Class of 2011 graduate Jamal Morris was struck by an unidentified hit-and-run driver April 16. The 27-year-old passed away on April 18 at Penn Presbyterian Medical Center after he succumbed to his injuries. Morris’s family is asking that the driver turn themselves in. “As a mom, I am pleading with the person who hit my son. I forgive you. So you need to know that I forgive you. Please come forward,” Morris’s mother, Channabel Latham-Morris, told The Inquirer. A press conference with Captain John Wilczynski of the Philadelphia Police Department took place outside of Penn Presbyterian Medical Center April 19. At this conference, Wilcynzski stated that Morris was riding a red Chainboard bike when he was struck. “It looks like seven people will get an organ from Jamal,” Morris’s mother said at the conference, referencing his status as an organ donor. Morris received his bachelor’s degree in mechanical engineering from Drexel’s College of Engineering. He served as a piping designer at Amec Foster Wheeler and as a Temporary Recreation Aide at the University of Pennsylvania’s Pottruck Health and Fitness Center. Anyone with information on this incident is encouraged to contact the Accident Investigation District at 215-865-3180. Drexel’s Counseling Center is available to any students who may need assistance dealing with the loss of Morris. Students can reach out to the counseling center by calling 215-895-1415 during normal business hours or 215-416-3337 outside of normal business hours.